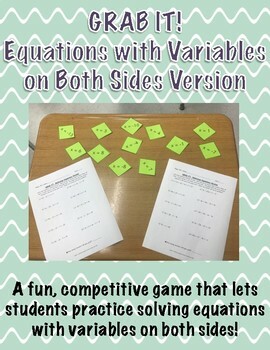 Math games are a great opportunity for students to be involved in their math activities. Note: This game is included (along with plenty of others) in my GRAB IT! Solving Equations Game GROWING Bundle! GRAB IT is a competitive game that is played in pairs! To play, print out a different game board for Player #1 and Player #2. Print & cut the answer cutouts on colored paper. (You may want to laminate for future use.) . Students will lay the cutouts out in front of them. 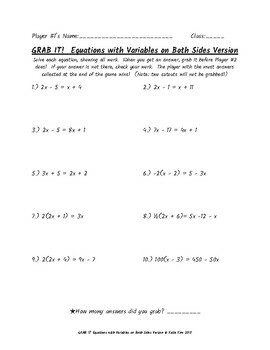 When they are ready to begin, each student will begin solving #1 on their worksheet, showing all work. The equations are different; however, their answers will be the same if the solve them correctly. As soon as a student gets an answer, he or she will grab the cutout with the matching answer. Students will continue solving and grabbing correct answers until they are all picked up. (They should solve each problem simultaneously. One student should not be ahead of the other.) The student with the most correct answers in his or her possession at the end of the game wins. 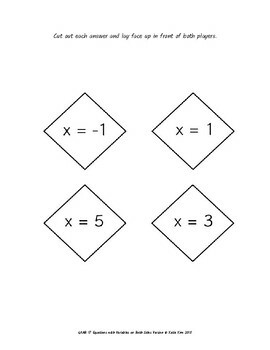 There are two extra cutouts so that the answer to the last equation is not given away by process of elimination. 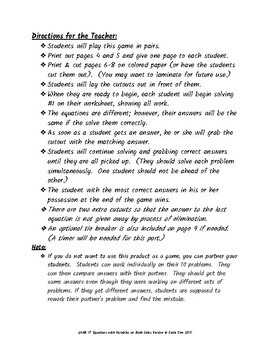 If you do not want to use this product as a game, you can partner your students. Students can work individually on their 10 problems. They can then compare answers with their partner. They should get the same answers even though they were working on different sets of problems. If they get different answers, students are supposed to rework their partner's problem and find the mistake.